Most of Miami's football success has come from recruiting great high school talent. But now and then, a junior college transfer comes in and makes a sudden impact. Glendale, California native Harold "Hal" Sears was one of them. 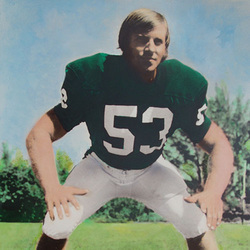 In just two seasons at Miami, Sears piled up some incredible numbers from his middle linebacker position, including a 26 tackle (21 solo) performance at South Bend, Indiana against Notre Dame in 1971 ! That performance earned him the Associated Press Lineman of the Week award. The standout performances did not stop there, as Sears went on to record 117 total tackles during his senior year to earn first team All-American status, once again by the Associated Press. After his playing career ended, Sears went on to serve as a Navy radio man for 15 months in Cam Ranh Bay during the Vietnam War, making Sears' events both on and off the playing field worthy of note. Hal currently resides in Miami, where he is a fire department captain.